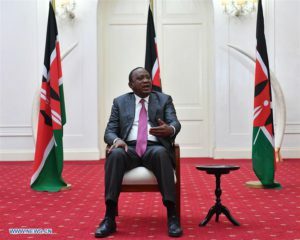 Kenyan President Uhuru Kenyatta speaks during a past event. He will be sworn in on November 28, for his second and last term of office. File photo. KENYA–The Supreme Court has upheld president Uhuru Kenyatta’s victory ahead of his swearing in on November 28. Making the ruling on Monday, the six-judge bench dismissed two petitions against the vote, one filed by former Kilome MP Harun Mwau and the other by activists Njonjo Mue (International Commission of Jurists) and Kheleft Khalifa (Muslims for Human Rights). “The court has unanimously determined that the petitions are not merited. The petitions are hereby dismissed. The presidential election is upheld,” Chief Justice David Marag said. IEBC declared Uhuru the winner of the October 26 elections with 98 per cent of the vote after rival Raila Odinga boycotted the contest. Only 39 per cent of registered voters took part. The repeat poll was ordered by the Supreme Court after it annulled the results of the August election, won by Uhuru, over procedural irregularities. In last week’s court proceedings, lawyers for both sides – those challenging the poll and those defending it – argued that the country was on the brink and will “plunge into the abyss” depending on the court’s ruling. The petitioners asked the court to nullify the election on grounds that there was low voter turnout and violence in some areas that saw the election not conducted. Enactment of the amendment to the election laws and whether it had any impact on the October 26 election were the other factors the judges considered. The judges also considered Raila’s withdrawal and if the move had an impact, failure to conduct fresh nominations for presidential candidates and failure to conduct polls in 25 constitutes. The full judgment will be delivered in 21 days.